Danger Wave! 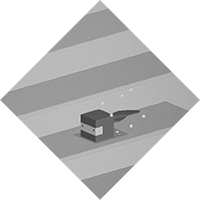 Escape the wave and guide up to 16 characters trough a dangerous maze of obstacles and traps . Slow down time to plan for shots, collect coins and use power ups to fly as far as possible. Hurry up, the wave is always right behind you.